We seek to point others to Jesus Christ. The Bible teaches beyond any shadow of a doubt that Jesus Christ is God Almighty come in the flesh. He is the way, the truth, and the life. And He is the head of the church! We believe in His sinless life, His miracles, and His teachings. His substitutionary atoning death, bodily resurrection, ascension into heaven, continuous intercession for His people, and His visible return to reign gloriously! We believe that when He ascended up into heaven, He sent the Holy Spirit to teach, guide, and direct His church, giving gifts and gifted people. The Soldiers of Christ Outreach Ministries is a family that you can call your own. The Soldiers of Christ Outreach Ministries is a non-denominational / non-doctrinal ministry. We are not opposed to denominations, only the overemphasis of special doctrines or traditions that divide the body of Christ instead of unifying it. We believe that God’s love, which is greater than any of our differences, is the true basis of Christian fellowship, and we look for the presence of His love in our lives as the greatest evidence that we are truly following Him. 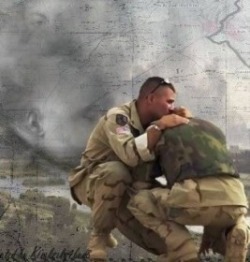 The Soldiers of Christ Outreach Ministries helps to provide the necessary weapons and ammunition needed to fight the enemy and become devoted Soldiers in the Army of the Lord. So put on your armor! Prepare for battle! Become a Soldier of Jesus Christ today! Help us to spread the Gospel of Jesus Christ right in your own home area! Become a Soldier in the SOCOM Army today! For more information, go to the SOCOM Recruiting Office.